“Affiliate” shall mean, with respect to a party, any entity that directly or indirectly controls, is controlled by, or is under common control with such party, where “control” (or variants of it) shall mean the ability (whether directly or indirectly) to direct the affairs of another by means of ownership, contract or otherwise. “Malicious Code” shall mean viruses, worms, time bombs, Trojan horses and other harmful or destructive code, files, scripts, agents or programs. “Order Form” shall mean the ordering documents for Customer’s purchases of Paid Services from Alberta 55 plus that are executed by the parties or accepted by the Customer from time to time. “Platform” shall mean Alberta 55 plus’s proprietary sports management technology platform. “Start Date” shall mean the date on which Alberta 55 plus shall make the Paid Services available to Customer as set forth in an applicable Order Form or SOW. “Statement of Work” or “SOW” shall mean the document describing the scope and schedule of Paid Services, if any, to be performed by Alberta 55 plus for Customer. “Subscription Term” shall mean the subscription period set forth on an applicable Order Form or SOW. 2.1. Alberta 55 plus Responsibilities. Alberta 55 plus shall: (a) make the Paid Services available to Customer in a manner that is consistent with generally accepted industry standards; (b) use commercially reasonable efforts to ensure that the Paid Services perform in material compliance with any documentation or user guides provided to Customer; (c) provide standard support to Customer at no additional charge, unless otherwise set forth in the applicable Order Form or SOW; and (d) use commercially reasonable efforts to make the Platform available twenty-four (24) hours a day, seven days a week, except for: (i) planned downtime (for which Alberta 55 plus shall give at least eight (8) hours electronic notice); or (ii) any unavailability caused by a Force Majeure Event. 3.1. Fees. Customer shall pay all fees, expenses or charges specified in all Order Forms and/or SOWs (“Fees”). Except as otherwise provided in these Subscriber Terms or the applicable Order Form or SOW, all payment obligations are non-cancelable and all amounts paid are non-refundable. 3.2. Invoicing and Payment. If the Order Form or SOW specifies that payment will be by credit card, debit card or ACH, Customer will provide Alberta 55 plus with valid and updated payment information and hereby authorize Alberta 55 plus to process payment for all Paid Services listed in the Order Form or SOW for the Subscription Term (including any renewal subscription term(s)). Such charges shall be made in advance, either annually or in accordance with any different billing frequency stated in the applicable Order Form or SOW. If the Order Form specifies that payment will be by some other method, Alberta 55 plus will invoice Customer in advance and otherwise in accordance with the relevant Order Form or SOW. Unless otherwise stated in the applicable Order Form or SOW, invoiced charges are due upon receipt. You are responsible for providing complete and accurate billing and contact information to Alberta 55 plus and notifying Alberta 55 plus of any changes to such information. 3.3. Overdue Charges. Customer’s failure to timely pay any Fees that are not the subject of a good faith dispute of which Customer notifies Alberta 55 plus in a detailed writing (“Undisputed Fees”) shall constitute a material breach of the Agreement. If any amounts for which Customer is responsible are overdue, then Alberta 55 plus may provide Customer with written notice of the same (a “Late Notice”). If Customer fails to pay all overdue amounts within ten (10) business days after Customer’s receipt of the Late Notice, then Alberta 55 plus may, in addition to any of its other rights or remedies, suspend access to the Paid Services until all overdue amounts are paid in full. If Customer fails to pay all overdue amounts within thirty (30) days after Customer’s receipt of the Late Notice, then Alberta 55 plus: (a) may terminate this Agreement, including all Order Forms and SOWs the in effect; (b) shall be entitled to recover from Customer (i) interest on all overdue amounts at the lower of a rate of one and one half percent (1.5%) per month or the maximum rate permitted by law (“Interest”); and (ii) all fees and costs (including reasonable attorneys’ fees, court costs and collection agency fees) incurred in seeking collection of such overdue amounts (“Collection Costs”). 3.4. Taxes. The Fees do not include any taxes, levies, duties or similar governmental assessments of any nature, including, for example, value-added, sales, use or withholding taxes assessable by any jurisdiction whatsoever (collectively, “Taxes”). Customer is responsible for paying all Taxes associated with its purchases hereunder. If Alberta 55 plus has the legal obligation to pay or collect Taxes for which Customer is responsible under this Section, the appropriate amount shall be invoiced to and paid by Customer, unless Customer provides Alberta 55 plus with a valid tax exemption certificate authorized by the appropriate taxing authority. For clarity, Alberta 55 plus is solely responsible for taxes assessable against Alberta 55 plus based on Alberta 55 plus’s income, property and employees. 4.1. Alberta 55 plus Warranties. Alberta 55 plus represents and warrants that: (a) the functionality of the Platform will not be materially decreased during a Subscription Term; (b) it will utilize software and other security means designed to prevent the Platform from containing or transmitting Malicious Code; (c) it owns or otherwise has sufficient rights in the Paid Services to grant to Customer the rights to use the Paid Services granted herein; and (d) the Paid Services will be performed in a professional and workmanlike manner in accordance with generally accepted industry standards. 5.1. By Alberta 55 plus. Alberta 55 plus shall defend, indemnify and hold Customer, its Affiliates, and their respective officers, directors, agents and employees, harmless against any loss, damage or costs (including reasonable attorneys’ fees) (“Losses”) incurred in connection with any claim, demand, suit or proceeding (“Claim”) made or brought against Customer by a third party relating to: (a) Alberta 55 plus’s violation of applicable law, rule or regulation in providing the Paid Services; and/or (b) Customer’s use of the Paid Services in a manner permitted by these Subscriber Terms and the Terms Use that infringes the intellectual property rights of such third party; provided, however, that Alberta 55 plus shall have no such indemnification obligation if the Claim relates (i) to a third-party product made available through the Paid Services or (ii) to use of the Paid Services in combination with data, software, products, processes, or other materials not provided by Alberta 55 plus where such infringement would not have occurred but for the combination. 5.3. Procedure. As an express condition to the indemnifying party’s obligation under this Section 5, the party seeking indemnification must: (a) promptly notify the indemnifying party in writing of the applicable Claim for which indemnification is sought, provided that failure to timely provide such notification shall not release the indemnifying party from its indemnification obligations except to the extent such failure has prejudiced the party seeking indemnification; (b) grant the indemnifying party sole control over the defense of such claim; and (c) provide the indemnifying party with all non-monetary assistance, information and authority reasonably required for the indemnifying party to defend and settle such Claim. 6.1. Term of Subscriptions. Subscriptions to the Paid Services commence on the Start Date and continue for the Subscription Term specified in the applicable Order Form or SOW. Unless otherwise set forth in an Order Form or SOW, subscriptions shall automatically renew for additional periods equal to the expiring Subscription Term or one (1) year (whichever is shorter), unless either party gives the other notice of non-renewal at least thirty (30) days prior to the end of the then-current Subscription Term. The pricing during any automatic renewal term will be the same as that during the immediately prior term unless Alberta 55 plus has given Customer written notice (which may be given electronically) of a pricing increase at least sixty (60) days prior to the end of the then-current term, in which case the pricing increase will be effective upon renewal and thereafter. 6.2. Termination for Cause. Either party may terminate this Agreement for cause for a material breach of this Agreement by the other party upon thirty (30) days’ prior written notice thereof if such breach remains uncured at the expiration of such period. Upon any termination for cause by Customer, Alberta 55 plus shall refund to Customer any prepaid fees covering the remainder of the Subscription Term after the effective date of termination. Notwithstanding the foregoing, termination for cause by Customer shall not relieve Customer of the obligation to pay any Fees accrued or payable to Alberta 55 plus prior to the effective date of termination. 6.3. Surviving Provisions. Section 1 and Sections 3 through 7 shall survive any termination or expiration of this Agreement, regardless of the cause of termination. 7.1. Relationship of the Parties; Third Party Beneficiaries. The Agreement does not create a partnership, franchise, joint venture, agency, fiduciary, or employment relationship between the parties. Unless otherwise provided in the applicable Order Form or SOW, there are no third-party beneficiaries to the Agreement. 7.2. Force Majeure. Neither party is responsible for delays or failures to perform its responsibilities under the Agreement (other than payment obligations) due to causes beyond its reasonable control, including but not limited to acts of God, acts of government, flood, fire, earthquakes, tornadoes, civil unrest, acts of terror, strikes or other labor problems, computer, telecommunications, internet service provider or hosting facility failures or delays involving hardware, software or power systems, Malicious Code, denial of service attacks, and inability to obtain energy (each a “Force Majeure Event”); provided, however, that it will resume performance as soon as reasonably practicable. 7.3. Notices. Unless otherwise specified herein, any notice, request, approval or written consent required under the Agreement shall be sufficiently given if in writing and delivered in person or mailed (certified or registered mail, return receipt requested) by one party to the other at the address set forth in the applicable Order Form or SOW or to such other address as the recipient may furnish in writing to the sender. Notice shall be effective upon receipt. 7.4. Entire Agreement. This Agreement constitutes the entire agreement between the parties with respect to the subject matter set forth in the Order Forms and SOWs, and supersedes all prior and contemporaneous agreements, proposals or representations, written or oral, concerning its subject matter. No modification, amendment, or waiver of any provision of any Order Form or SOW shall be effective unless in writing and signed or accepted by both parties hereto. Notwithstanding any language to the contrary therein, no terms or conditions stated in a Customer purchase order or in any other Customer order documentation (excluding Order Forms and SOWs) shall be incorporated into or form any part of the Agreement, and all such terms or conditions shall be null and void. 7.5. Changes to these Subscriber Terms. 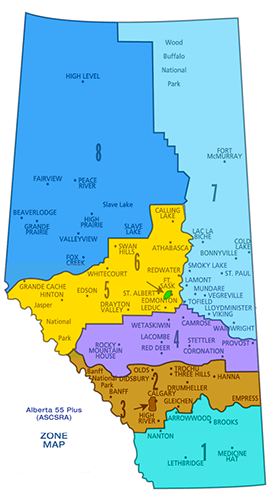 Alberta 55 plus may, in its sole discretion, change, modify or amend these Subscriber Terms from time to time, in whole or in part, by posting revised Subscriber Terms on its website at least thirty (30) days prior to the effective date of such change. Customer may terminate this Agreement in its entirety (including all Order Forms and SOWs) during such thirty (30) day period upon written notice to Alberta 55 plus and Alberta 55 plus shall refund to Customer any prepaid fees covering the remainder of the Subscription Term after the effective date of termination. Notwithstanding the foregoing, termination for cause by Customer shall not relieve Customer of the obligation to pay any Fees accrued or payable to Alberta 55 plus prior to the effective date of termination. Customer’s continued use of the Paid Services after any such change constitutes Customer’s acceptance of the new Subscriber Terms.